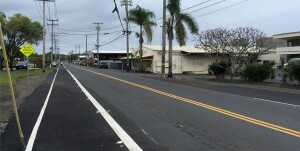 In conjunction with the 53rd Annual Merrie Monarch Festival, a temporary one-way traffic pattern will be in effect on Kalanikoa Street in Hilo. Traffic will be allowed to flow in the makai, or northerly direction on Kalanikoa Street between Piʻilani Street and Kuawa Street during the festival. The one-way traffic pattern will remain in effect around the clock from 12 noon Wednesday, March 30, through 8 a.m. Sunday, April 3.